Watch this panel to hear from business leaders at top electric utilities. 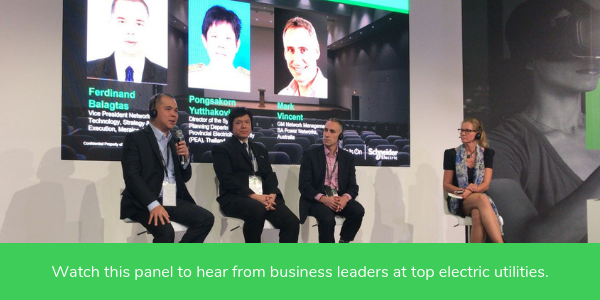 From the left to the right: Meralco’s Ferdinand Balagtas, Provincial Electricity Authority’s Pongsakorn Yutthakovit, South Australia Power Networks‘ Mark Vincent and Schneider Electric’s Carola Puusteli. Flood, heat, storm? No matter. Electric utilities can keep power flowing Going Digital Gives Electric Utilities a Business Advantage Digital Tech Helps Electric Utilities Improve Customer Sustainability—And Their Own How can Electric Utilities Minimize the Chance of Substation Shutdown?